While you surely know Kentucky for KFC, you may not have heard of their soccer hopefuls, Louisville City FC. Despite playing in 2nd league they draw significant crowds and are ready to grow. Louisville City FC aren’t among the 12 candidates for MLS expansion, but would like to join the league in the long run. With no promotion/relegation system, main criteria include a steep $150 million entry fee and new stadium, among other expectations. Now we know where that new LCFC stadium would be built. The first stadium Louisville City FC will call their own is about to be built just east of downtown, alongside the city’s largest highway hub and just south of the border with Indiana. It will replace a large auto parts depot and become one of the catalysts of revitalization for this derelict part of Butchertown district. Altogether 5 plots of 40 acres (16 hectares) are earmarked for the development. The site is notably located just 770 meters east of LouCity’s first professional ground (though baseball-specific), Slugger Field. This is where they currently draw 7,218 people per game, quite large crowds for a compromised stadium and a team with no history. Capacity of the single-tiered stands was set at 10,000 in starting layout. 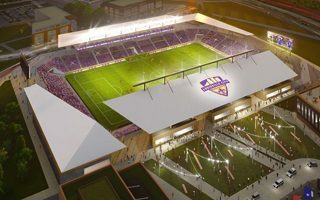 This should suffice for 2nd league (USL, formerly regarded as 3rd league) needs of LouCity, but also leaves enough room for the club to grow and reach MLS level by bringing the capacity up by 10,000 additional seats. While no exact budget has been announced as of yet, the stadium should be built in time for 2020, before the team’s potential advance to MLS.